There’s simply nothing like exploring a country by ship, and there’s no better place to experience it than Europe. Not only is the scenery stunning, the historical importance of European rivers adds an extra dimension to the cruising experience. Add to this the guarantee of the finest gourmet food and wine. And you can see why so many travellers are booking a cruise to truly experience the best that Europe has to offer. We went on a day-trip cruise around Austria with the ship anchored at some points for at least half an hour. To be exact, the stops included Vienna Nussdorf-Tulln-Krems-Dürnstein-Rossatz-Weißenkirchen-Spitz-Emmersdorf-Emmersdorf-Melk-Ybby. 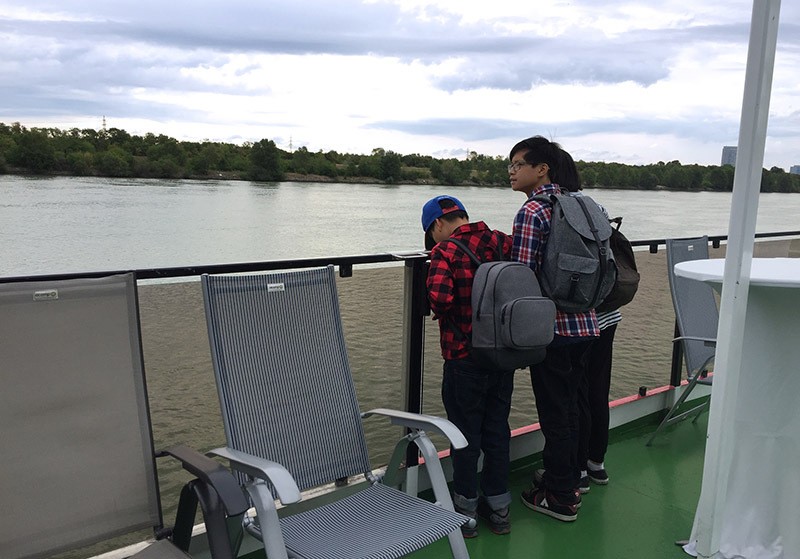 We were able to taste wine at one stop (Tulln), and enjoyed a bit of nature as we explore the areas near the ports even for a short time. The cruise took about 14 hours in total coming back to Vienna as the main port, food was extravagant, we were served breakfast, lunch buffet, afternoon snacks, and dinner. It was worth the price, of course. If you’re considering this for your next getaway, here are 3 of the top luxury river cruises to truly explore Europe in style. Switzerland provides a haven for cruise enthusiasts looking to spend their holiday exploring some of the most scenic landscape. Starting in Geneva, you can spend 30 days cruising in the height of luxury through Switzerland’s stunning mountainside scenery. Go exploring immaculate towns, and enjoying the striking medieval architecture. With a cruise of this calibre, the hardest part will be having to return home! There’s simply something special about this river, and taking a scenic cruise along the Seine as it flows through Paris is definitely something to add to your travel bucket list. Admire the stunning examples of French architecture as you explore this iconic river on board a boutique cruise vessel. The finest food, wine and cultural experiences await you on this beautiful river cruise through the heart of France. For those who want to travel out of Paris, a stop along the Seine at Les Andelys is heralded as being one of the most picturesque places in France. Rhine is one of the most diverse river cruises in Europe. A tour of the Rhine will take you through five different countries. This will be a spectacular cultural journey that is simply unforgettable. These include Switzerland, Germany, Netherlands, Germany and France. Not only is the landscape breathtaking, but you will have the opportunity to explore a range of fascinating destinations that truly characterise European culture and lifestyle. As you cruise through Germany, you’ll have the chance to see the stunning Black Forest region. Its fairy-tale style castles and picturesque scenery that is perfect for those with a passion for photography. A stop in Amsterdam will give you a first-hand experience of the nightlife that this city is famous for. If you want to experience a truly unforgettable European river cruising adventure, the Rhine is for you. There’s nothing like exploring the best of Europe in the utmost luxury to create memories that will last a lifetime. For the best deals and latest information on European river cruising, check out my GetYourGuide link. Search itineraries, learn about your destinations and find unbeatable prices on your favourite cruise all in one convenient place. Treat yourself to a taste of luxury with a sophisticated European river cruise for your next holiday. What a great travel experience this would be! I am going to add a European River Cruise to my bucket list.